Washington DC, 16 February 2014: A number of activists, both individuals and organizations, came out today to raise awareness about the situation of political prisoners in Iran, especially those who are in dire need of medical care that is being withheld by the regime as a form of torture and slow execution. 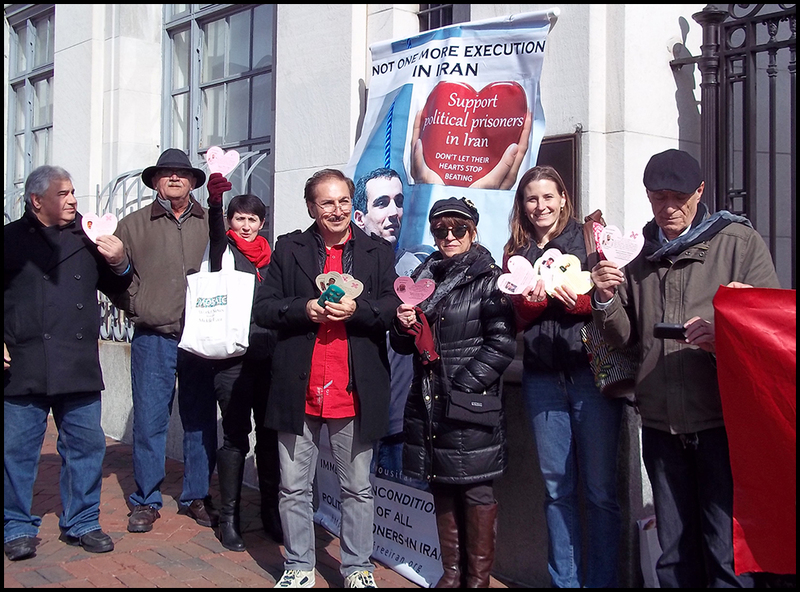 Under the CFPPI campaign theme of “Don’t Let Their Hearts Stop Beating,” activists met at the corner of M St. and Wisconsin Avenue in Georgetown, Washington DC to share special Valentines with passers-by. Each Valentine distributed had the name, picture and profile of an Iranian political prisoner in urgent need of medical attention. Political prisoners who appeared on the Valentines included Saeed Abedini, Rasoul Bodaghi, Hossein-Kazamani Boroujerdi, Mostafa Daneshjoo, Ahmad Daneshpour, Behnam Ebrahimzadeh, Zeinab Jalalian, Mohammad Jarahi, Omid Kokabee, Hossein Ronaghi Maleki, Zanyar Moradi, and Reza Shahabi. These represented only a handful of the many political prisoners in urgent need of medical care. We demanded the immediate and unconditional release of all political prisoners in Iran, and we called for the downfall of the Islamic regime in Iran. After we distributed approximately 300 Valentines in Georgetown, we marched to the offices of the Islamic Republic regime to cover the front window with demands for the release of political prisoners. We again chanted slogans in English and Farsi demanding the release of political prisoners in Iran and the downfall of the regime. The organizers of this action, Mission Free Iran, Unity for Democracy and Justice in Iran, and the Campaign to Free Political Prisoners in Iran, thank everyone who joined the action today, including those who stopped to talk with us and learn about the situation of political prisoners in Iran. Handing out “Valentines” about political prisoners in Iran in Georgetown, Washington DC..
Handing out “Valentines” about political prisoners in Iran in Georgetown, Washington DC. We demand the immediate and unconditional release of the beloved held as political prisoners in Iran.